I know the name 'bitter gourd' itself is not appealing to many (that includes my sis too).But to be frank,me and h have a soft corner for this vegetable and we love all the recipes with pavakka(karela).This is always in my grocery bag during my visits to Indian grocery store.Today's recipe is a pickle made with bitter gourd.Sounds weird?? Bitter gourd when pickled,the bitterness is generally reduced with the addition of vinegar and adds a nice tangy flavor.Mom used to make this pickle and I used to relish the most as a side dish for rice like stir fries and not like pickles.These days I have reduced making any pickles because they vanish off soon and pickles aren't very healthy with the amount of spice and salt used.However,I avoid buying store brought pickle unless its an urgent need as they are loaded with salt.Now,as you all know we are on Lent till Easter and so pickles are in demand with vegetarian dishes.This pickle is best preserved in refrigerator.Try & enjoy !! Wash and chop the bitter gourd in thin slices.Steam the chopped bitter gourd with salt,turmeric powder and water(1/4 cup).Cook until its wilted and half cooked(4-5 mins on medium flame).Switch off flame,drain the water if you have any.Heat oil in a pan,add the bitter gourd slices and shallow fry the till lightly crisp.Drain in a plate and leave aside(Do in 2-3 batches as over crowding makes it mushy and doesn't fry good). Heat oil in the same pan if using same oil.Splutter mustard seeds.Add in sliced garlic and ginger followed by curry leaves.Saute until its slightly browned. Add in the chilly powder,asafoetida and fenugreek powder on low flame.Add the fried bitter gourd pieces and add salt,vinegar.Toss well.Cook on low flame for 2 minutes until everything looks well combined.Switch off flame,cool completely and store in clean dry glass containers/clay pots in refrigerator.Serve with rice !! * I have used gingelly oil for frying the bitter gourd too but you can always use vegetable oil for shallow frying and then use gingelly oil for pickling. 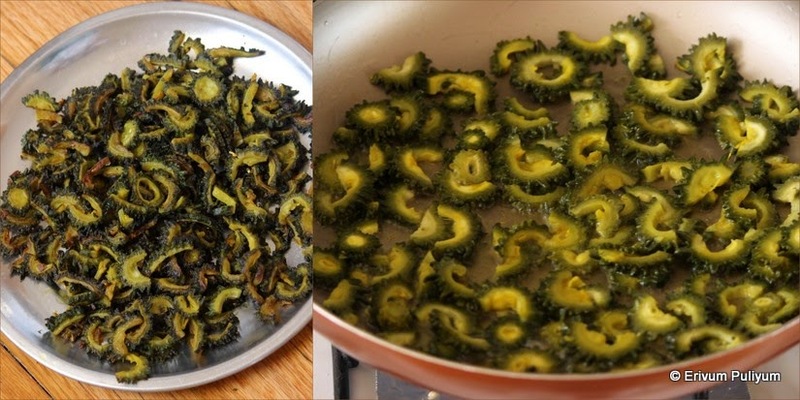 * Don't deep fry the pavakka(bitter gourd) as they don't taste good that way and can't be used instantly. * I have used a combination of kashmiri chilly powder and hot chilly powder.Modify as per your tolerance. * The bitter gourds shrinks to less than half the quantity once its fried and pickled,so double the quantity and make more if you wish to make larger batches. * If you aren't very comfortable with bitter flavors,then cook the bitter gourd with more water.Drain the water and then use.Draining the water discards most of the bitterness.I generally add only little water to cook to retain the bitter flavors and use up the water in cooking. For more pickle recipes from this space,click this link. This is mouth watering. Have never tried bitter gourd pickle. I hear u Julie pickles simply vanish so true :) Achar looks ugran I need to try this at home we make a different kind with bittergourd. That picture makes me drool though I don't like pavakka... such a nice red hue!